Marcia Schmidt Blaine is an advocate for higher education and has shifted from purely academic work into administrative challenges, joining the President’s Office in January, 2017. She serves as Executive Director of Government Relations, working with politicians and public servants at the local, state, and national levels in cooperation with the University System of New Hampshire to create better communication and understanding between all entities. She also works on special projects for the President, connecting multiple offices, departments, committees, and individuals involved in a variety of areas to streamline efforts for maximum efficiency and impact. She is taking the lead on Complete College America and Purpose First initiatives to build partnerships with the community colleges to bring tools that aid in persistence. Blaine graduated from the College of William & Mary in Williamsburg, VA with a B.A. in History. She received her M.A. and Ph.D. from the University of New Hampshire. 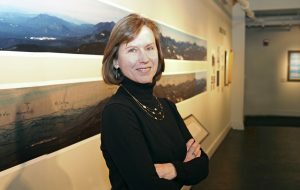 She joined the faculty of Plymouth State in 2002.